"Rethinking Teaching, Learning and Assessment in the Twenty-First Century Law Curriculum"
Introduction: For much of the past decade, legal education as provided by university law schools has been under review and criticism in many places in the common law world. A major review has just been completed in the UK. Only a few years ago two large-scaled studies in the US were conducted. Another, undertaken by the American Bar Association, is currently in production. And we should not overlook the 2001 Redmond-Roper Report, which reviewed and made recommendations on all stages of legal education here in Hong Kong. These studies are just a representative sample. Criticizing legal education is nothing new. 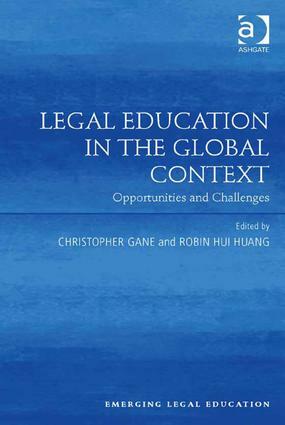 There are multiple stakeholders in legal education, and the factors that might trigger the need or perceived need for a legal education review are many, including political. They are usually driven, at least in part if not in the main, by a perception that there is a gap between academic achievement and professional requirements, that legal education is not fit for purpose. It is not uncommon to hear complaints from the profession that graduates have not been properly prepared for lawyering work. One observation that can be made is that although most of these reviews are concerned to some degree with issues of fitness for purpose, rarely do they examine the tools for learning that predominate in the law school curriculum. The focus is on larger, institutional issues. Contact the author for a copy.